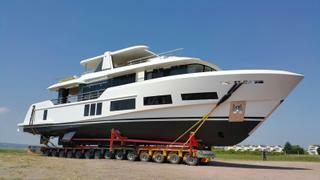 The 32.3 metre motor yacht Andreika has been launched in Istanbul by ICT Yachts. The yard adds that she has also completed her sea trials. Styled inside and out by London-based studio H2 Yacht Design, she features naval architecture and structural design by Laurent Giles. Accommodation on this 210GT yacht is for up to 12 guests split across five staterooms, including a full-beam owner’s cabin. Large rectangular portholes ensure plenty of natural light below decks, while extensive glazing on the main deck should make for a particularly bright interior on this level as well. Her star features include extensive deck spaces dedicated to al fresco relaxation, such as a main-deck dining area and a spacious superyacht sundeck. Built to RINA standards from a composite hull and superstructure, her vital statistics include an 8.1 metre beam and a maximum draught of 1.8 metres. Power comes from a twin MTU diesel propulsion system that allows for comfortable cruising at 18 knots and a top speed in excess of 20 knots. When trimmed back to 10.5 knots, Andreika will have a maximum cruising range of 2,000 nautical miles. Stephen Wallis from Laurent Giles Naval Architects explained that her semi-displacement hull form has been tank tested in Southampton, with the propeller tunnelling, stern wedges and spray rails carefully adjusted to optimise performance in both calm water and irregular head seas. 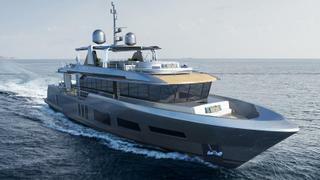 The Turkish yard adds that Andreika is intended to be the first in a range produced for Alpha Custom Yacht, a division of the Mexican company Performance Boats.